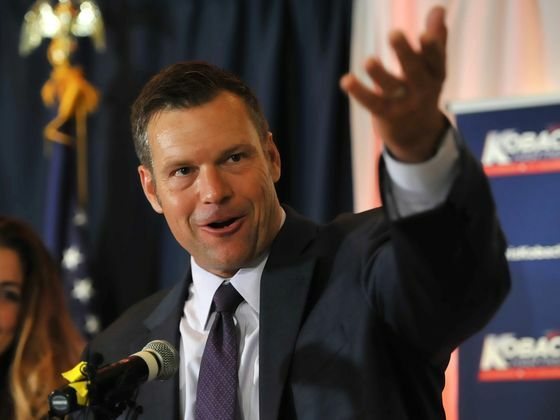 (Bloomberg) -- Kansas Secretary of State and President Donald Trump ally Kris Kobach claimed the state’s Republican nomination for governor after his opponent conceded, a week after the closely contested primary. Incumbent Governor Jeff Colyer on Tuesday said that he didn’t believe he could overcome Kobach’s 345-vote lead in any recount, the Kansas City Star reported. “I just had a conversation with the secretary of state and I congratulated him on his success and repeated my determination to keep this seat in Republican hands,” Colyer said, according to the newspaper. The day before the Aug. 7 primary, Trump gave an enthusiastic endorsement of Kobach, a polarizing figure known nationally as a fierce critic of illegal immigration, a backer of strict voter-identification laws and for making unsubstantiated claims about the prevalence of voter fraud. Colyer ran as a more pragmatic, results-oriented conservative and gained the backing of Bob Dole, the former Kansas senator and 1996 Republican presidential nominee, who said Colyer was the party’s best choice to win in November. Colyer had been the state’s the lieutenant governor and assumed the governorship after predecessor Sam Brownback quit earlier this year to become Trump’s envoy to promote religious freedom. Kobach said the president’s endorsement, via a tweet, was “absolutely crucial” to his victory, according to the Star. Colyer’s campaign and some other Republicans in the state had warned before the primary that Kobach’s controversial stances could cost the party the governorship in a state dominated by the GOP. Kobach will face Democratic nominee Laura Kelly, a state senator who defeated four men to get on the Nov. 6. general election ballot.